The airport was declared surplus property in November of 1945, allowing the city to obtain the 1,597 acre airport for $2. 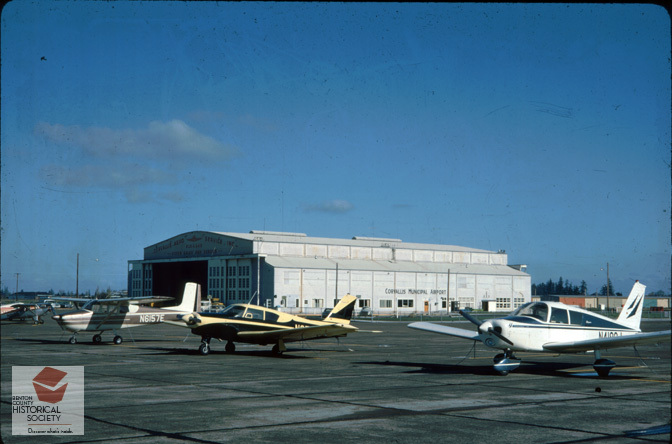 A few of the wartime buildings were sold but a hangar and repair facility were added by operator Marys Peak Aviation in 1978. In 1984, the city constructed new hangars and installed new instrument approach and landing systems. Today the airport (CVO) is home to 161 aircraft, including 3 jets and 7 helicopters. Companies doing business from the airport include Reach Medical Transport (helicopters) and Fed-Ex.